this year has been filled with travel. mexico, paris, new york, london, san francisco, germany, and soon to be australia next month! one of my favorite things to do when i travel is to unwind and have a cocktail in a new place. remember this “ron burgundy” drink in london or this rooftop bar in new york? there was the drake in toronto, the wine baby bottles in paris and the spicy drinks at east side showroom in austin. gotta love the delicious shandy at the parker and those copper moscow mule mugs in dallas. when i am not traveling, one of my go-to places to walk and have happy hour is the thirsty crow for these! 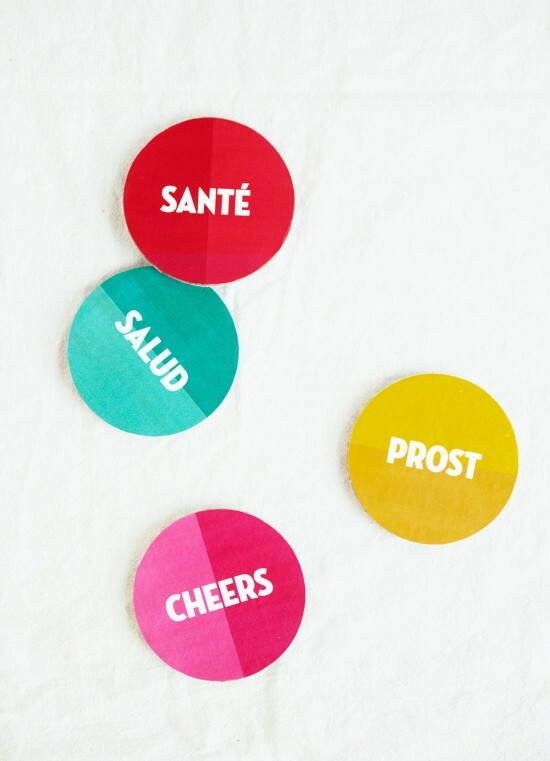 so i thought it would be fun to design a set of coasters that say “cheers!” in all of the languages that i’ve heard this year when i raised my glass. 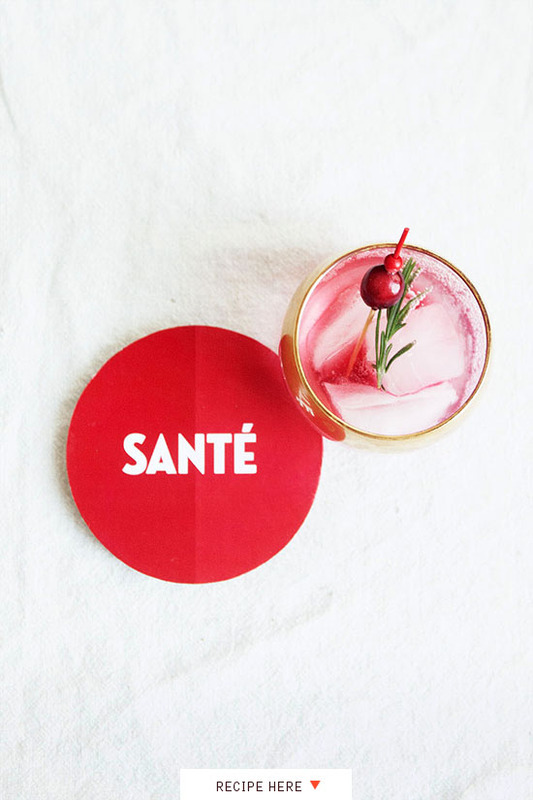 you can download the designs below and make these coasters for an upcoming happy hour in your house! • print the downloaded designs & cut them out. • “paint” on a generous but even amount of mod podge onto coaster and place cut circles on top of that. press firmly, flatten with fingers to get rid of bubbles. run tip of finger along the sides to get excess glue off. place under heavy book as it dries to keep from bubbling. • after they are dry, “paint” a coat of mod podge on top of the printed design and let dry completely. add 1 – 2 more coats. 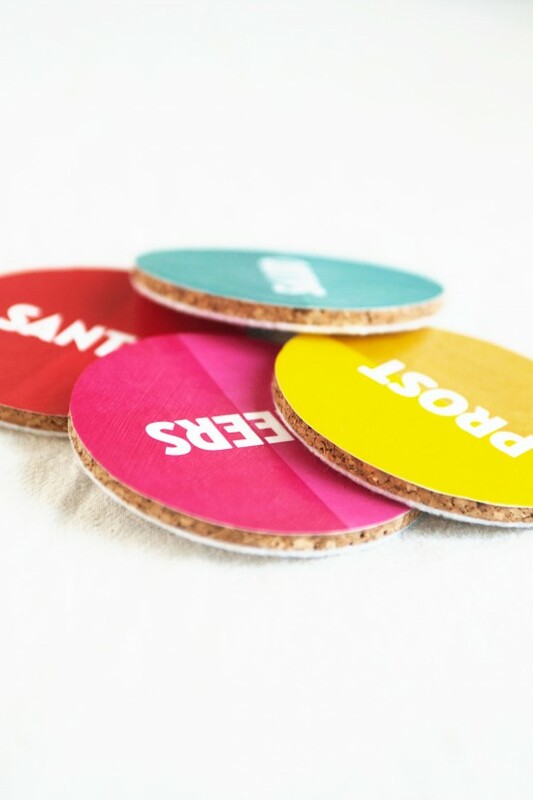 • glue on felt to the bottom of the coaster using tacky glue if you’d like! if you want to put those coasters to good use, you’d best make this recipe. now let’s make some syrups! • in a saucepan bring 2 cups of water and 1 cup of sugar to a slow boil. reduce heat, add add 4 sprigs of rosemary (we’re saving the 5th sprig for garnishes) and simmer for ten minutes. • not too different from the above. in a saucepan bring 1 1/2 cups of water, ginger and 1 cup of sugar to a slow boil. reduce heat, add bag of cranberries and stir. they will start to “pop” in about five minutes. that’s when it’s done. let cool, and pour through a fine mesh strainer into a glass container. 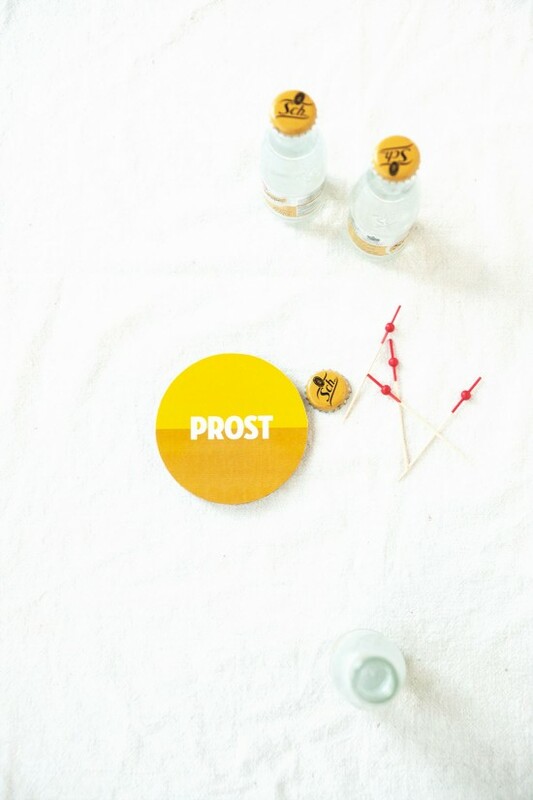 cheers, salud, prost & santè! recipe by: jen gotch, see more recipes here! sponsor: these holiday printables are brought to you by HP. 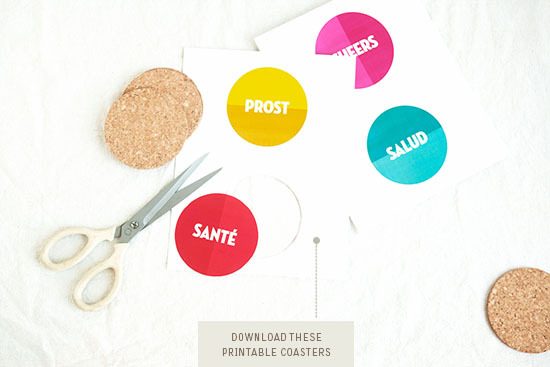 make other easy printable projects at HP’s Holiday HQ. This DIY could not come at a better time! I’ve been wanting more festive coasters and these are just perfect! Thanks! these are so cute & so simple! love them! Super cute! I’ve been in need of some coasters too! I can just imagine a vintage Coke bottle on top! Oh I love them! So fun! And that drink looks tasty too! You’re coming to Australia?! You’re really going to love it here. What parts of the country are you going? Oh you’ll love it – Sydney and Melbourne are both so different. The weather should be hot. It’s been a bit changeable in the last week or so but the temperature is heading up, up, up! If you don’t already know it, check out The Design Files blog… Lucy is a Melbourne-based blogger, but she interviews lots of creative types from all around Aus and they include their local tips for shopping, dining, bars, etc. Don’t worry about the flight – I guess we get used to it living so far from everywhere – but it’s really not that bad. I load up my iPad with magazines and catch up on relaxing and not working! And sleep. Love the coasters. 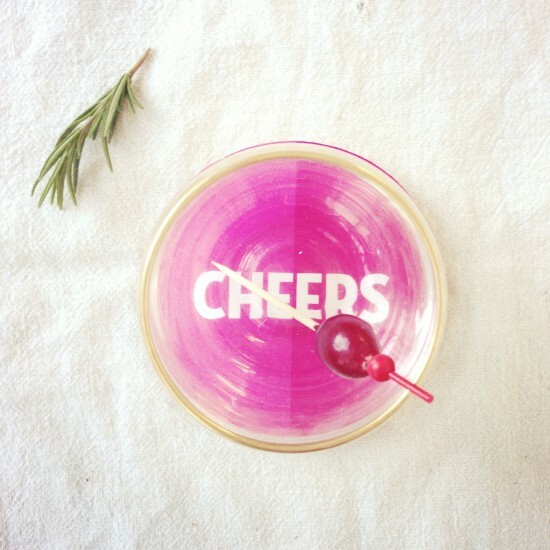 Too bad in Australia we too say ‘cheers’ instead of something more creative! Add Madame Brussels, Croft Institute, Seamstress and The Woods Of Windsor to your Melbourne “cocktail” haunts list if you get time. See you at the Melb Blogshop! Hello…I love this idea and plan to make these for a few gifts. I purchased the coasters at Cost Plus and realized that the templates are about 1/4″ too small…are there any other coasters that you can suggest? I can always get creative and make it work…hmmmm…. Bri, you’re a genius, for oh so many reasons, but with regard to this post… I scoured the internet and sampled recipes for months to find a house cocktail to serve to 150 guests at our Xmas party that was this past weekend. Settling on a pear basil something that was not alll that good, I stumbled on this the night before the party. I made a huge serving using a handle of vodka. It was gone within two hours -competing with a keg of SN, cases of wine and a fully stocked bar. After the bartender was dismissed, the late-stayers, in all their drunkenness tried to make their own. DEE-Licious! Thanks for saving me from a pear basil disaster! Oh, and I love you. LOVE this idea! It’s just charming. The best fish I ever ate was Blue Corral Trout in OZ-look for it-hopefully it isn’t endangered or fished out. I will be subscribing on your rss feed and I am hoping you write again soon! Simply awesome! I understand you have actually put a great deal of initiative into this as well as I desired to inform you how grateful I am! Hope you placed out even more remarkable things in the close to future and I will come back as well as read it!